The full-scale ornithopter is an engine powered aircraft that carries one pilot. All of the thrust and nearly all of the lift is created by the mechanical flapping of the ornithopter's wings. The two wings of the craft are joined by a centre section which is moved up and down by pylons connected to the drivetrain. The wings' thrust is due primarily to a low-pressure region around the leading edge, which integrates to provide a force known as "leading-edge suction". The wings also passively twist in response to the flapping. This is due to a structure that is torsionally compliant in just the right amount to allow efficient thrusting ("aeroelastic tailoring"). It should be noted, though, that twisting is required only to prevent flow separation on sections along the wing. 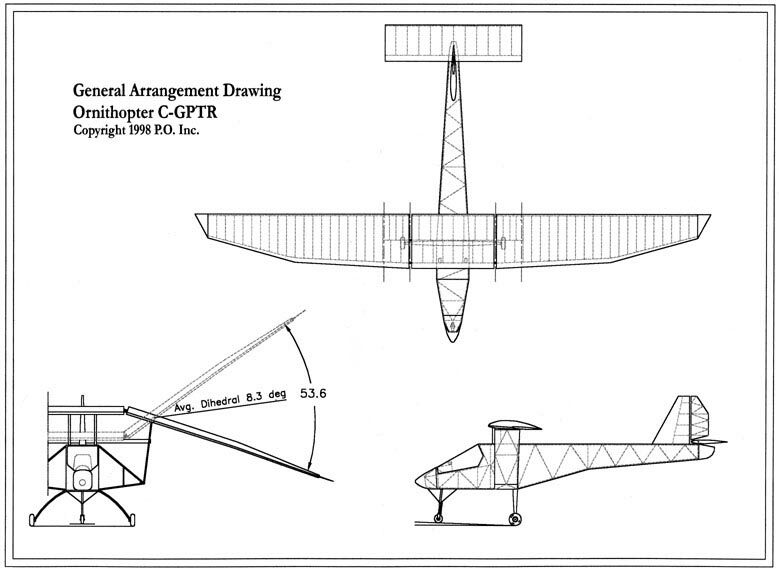 It does not produce thrust in the same way as required by sharp-edged wings with little leading-edge suction (see "An Ornithopter Wing Design" in the Research section). 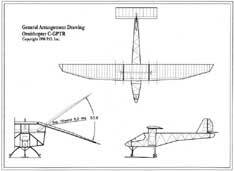 For a more in-depth description of the full-scale ornithopter's functioning please refer to "The Development and Testing of a Full-Scale Ornithopter " in the Research section. Don't miss our 3D interactive model of the ornithopter in the MultiMedia section!